CASH ONLY SALE. Proof of funds required for showings. 1890 Historic Home Designed by Harvey Ellis. This home is being sold with covenants, property has to remain a single family home and architectural elements can not be removed. New slate roof installed 3 years ago with copper valleys and flashing, over $45,000 spent on brick renovation, new retaining wall installed 4 years ago however, this property is still a major rehab. 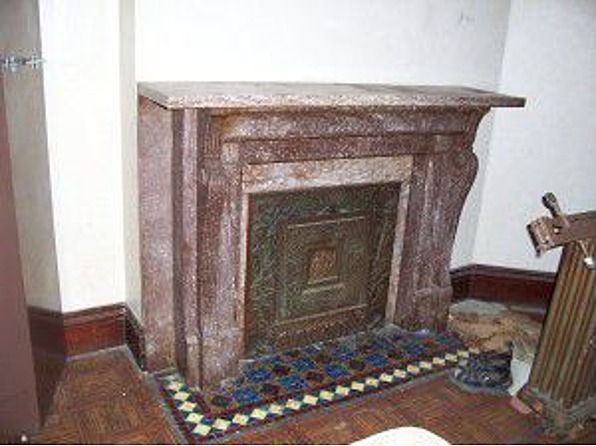 This is a great opportunity to own a piece of St Joseph History. Great for single family home or B and B. What a depressing neighborhood… It wouldn’t motivate me to buy this place at that price, for sure. Agree with Tracy on the grim setting. It’s a house with some great details, but even in a fitting setting I’m not wild for it. Not one of Ellis’ better designs. The street facade looks as though a much larger house were planned, work halted, and then resumed on a scaled-back scheme; that porch could/should have supported a skyscraper. It’s very beer baron baronial; you’d have to really like oak. “Beer baron baronial” — lol and so true. But I like it a lot… Move it to St Louis and I’d re-do it for my parents. The flickr photos of St. Joe reveal an amazing range of architectural styles during its heyday.http://www.flickr.com/photos/army_arch/sets/72157594523923103/detail/ John S has referred to St Joseph at various times, and now the reason why is plainly revealed: great treasuretrove of architecture. Thanks, Ms. Sloan, as always for another great enjoyable evening. John C., St. Joseph IS a treasure trove of architectural riches but St. Joe has gone down from the number 2 city in Missouri (after St. Louis) to number 6 or 7 at last count. It’s lost nearly 1/2 its population since 1900 when it peaked at over 100,000. Jobs there are scarce and poverty is a real problem. Over 1/2 of St. Joe students qualify for reduced or free school lunches. The old part of the town has a large tenant population while the newer residential areas to the east are populated by homeowners. Downtown is not dead but barely survives and much of it has been demolished over the years. (one grand hotel’s demolition (The Roubidoux) was used in a national beer commercial in the 1970’s. The iconic St. Charles Hotel prominently featured in the movie PAPER MOON, (which was filmed around St. Joseph) was demolished just before my arrival in 2004. 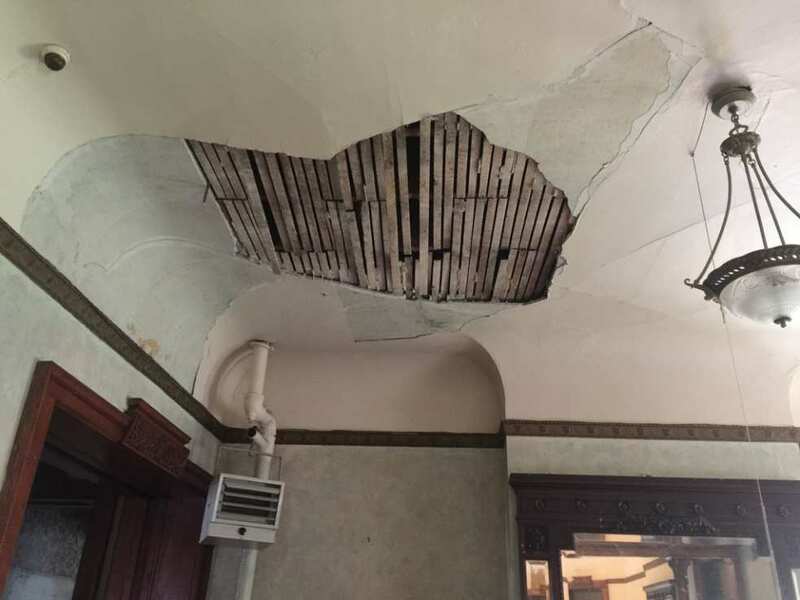 The city bureacracy is alternately sympathetic or hostile towards historic preservation and the city budget always has an immense amount targeted for demolitions. As a preservationist, by April 2006 I decided it was too depressing and relocated to northern California to engage in professional restoration work. (having done the same in St. Joe) It’s a tough town to make a living in and $12 an hour is considered good wages there for tradespeople. Need I say any more? Odd how professionals, insurance companies, auto dealers, etc., etc, don’t seem to scale their incomes down to the relation of $12.00 an hour when it comes to charging. Still, that leads us on to discussing some fictional golden age of balance in wages. Increasingly I come to the conclusion that places easily affordable in terms of preservation are those no longer serving as locations for new weatlh generation. One better bring the shekels and retirement income etc. for a lot of these smaller towns and cities. And then, of course, exploit the tradespeople just as you mention! John C. : “Increasingly I come to the conclusion that places easily affordable in terms of preservation are those no longer serving as locations for new weatlh generation. One better bring the shekels and retirement income etc. for a lot of these smaller towns and cities. John C., you hit the nail on the head here! Often the only reason for the survival of concentrations of old homes is due to a weak local economy that goes back decades. (back to the Great Depression in the case of St. Joe when over 450 local businesses folded, most within the span of a couple of years) Cities and communities that have experienced constant growth often have very few survivors from over a century ago. It’s an ironic twist of fate. I’ve been in this house many times; I mean dozens of times and have examined the details up close and dilligently. 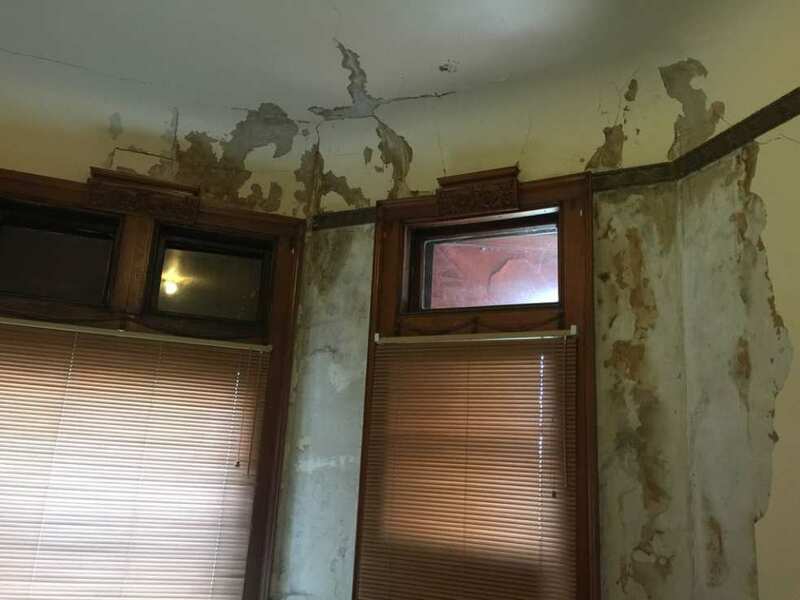 The worst thing about the house is that it was built of Arizona Red Sandstone and in St. Joe’s colder climate the freeze-thaw cycle causes the sandstone to delaminate and crumble. 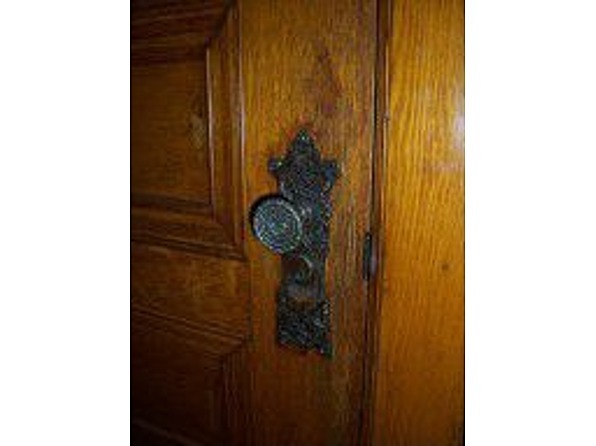 The buyer, to properly restore this one, will need to replace a lot of the carved exterior pieces. 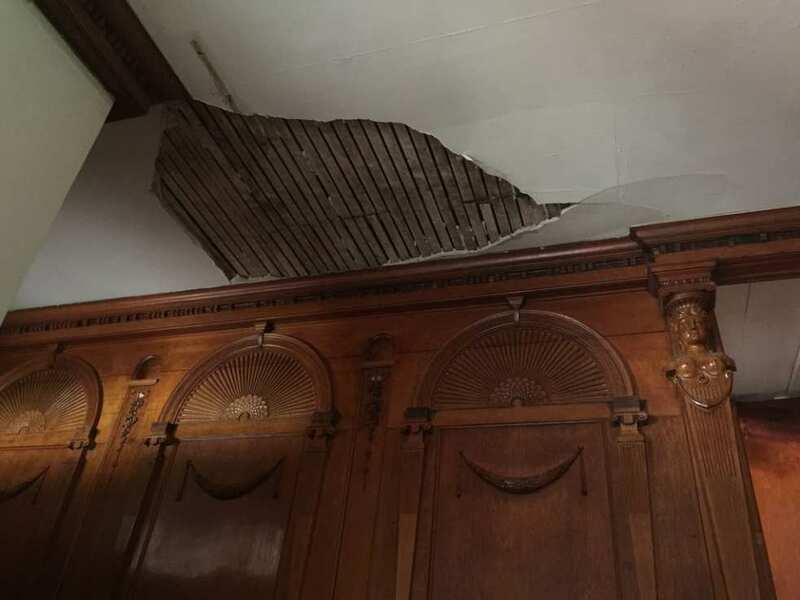 All except one of the 20 or so original stained glass windows on the ground floor are (long) missing. 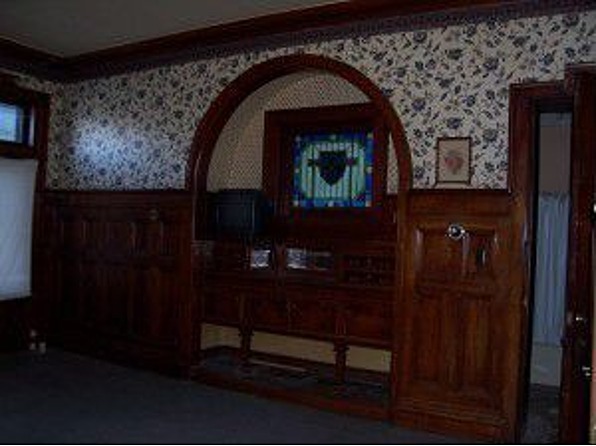 The woodwork is exquisite as are the Minton and Hollis encaustic tiles in the vestibule. 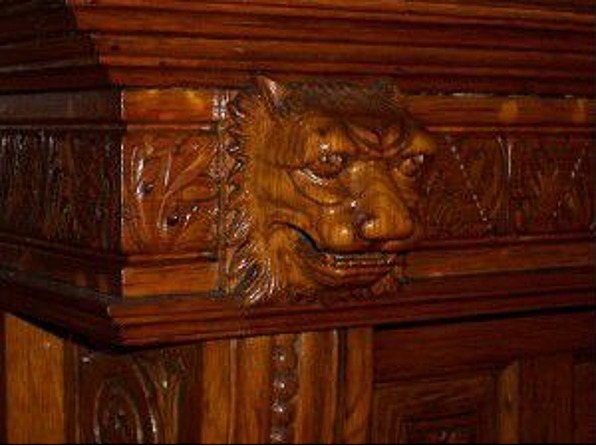 The (mainly oak) wood carvings are superior too. Lot’s of potential but this house has been on and off the market since 2005. Just went back to Zillow and realized that the Zestimate is $100,000 approximately with a bottom range of $66,000. I think that reinforces your caution, John, about the fact that this has been on the market off and on since 2005. Another startling fact is the property tax, low even by Missouri standards at some $700-odd dollars based on a $12,000-odd valuation. I think the woodwork is wonderful. Frankly, I’m surprised this hasn’t been stripped, considering it’s the only “mansion” for blocks around. That would be such a shame. Hope it isn’t torn down since finding a deep-pockets buyer in that neighborhood does not seem likely, does it?? This was undoubtedly done by Ellis while he worked as a partner in that local architectural firm. 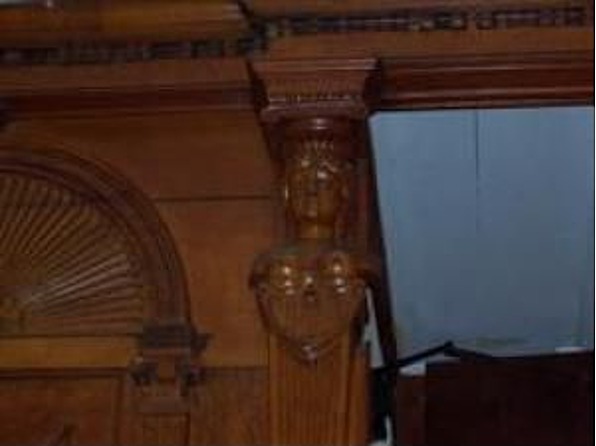 There is private historical architectural foundation in St Joseph dedicated to the memory of that relationship, http://nonprofitfacts.com/MO/Edmond-Jacques-Eckels-Harvey-Ellis-Historical-Foundation.html . I wonder if contacting that Foundation might lead to records about just what accounts for a very odd appearing design. I have come to the conclusion that Robert W is correct — there is something about this house that is “not right” in terms of proportion, etc. That porch that juts out but sits ready to support a skyscraper — I wonder if as envisioned there was a second story gallery or even summer time canvas roofs of some sort. John S., just read your comment. It sounds as though you are saying that one must replace the carved pieces with new pieces — but new pieces made of what? Surely not more delaminating Arizona stone? And if it is something different, what would be different but not look different? And if something is harder, etc., would we have the familiar problem we see in brick where someone introduces hard brick and moarter into a wall mainly composed of older, softer brick and soft moarter? Also, do you know for whom this house was built?. I have been trying to find it on historical registers, etc., and I can’t seem to do so by the address. Perhaps you know something of the circumstances of its design and building that you can share with us. How lucky you are to know this town so well. JAh, just saw that my cearlier omment of last night is still awaiting moderation this morning — that is why I didn’t get notice of these other ones. At last, at last,I can consider myself an immoderate fellow! Cathers, David: Genius in the Shadows : The Furniture Designs of Harvey Ellis. New York: The Jordan-Volpe Gallery, 1981. France, Jean R., Roger G. Kennedy, Black McKelvey, and Howard S. Merritt: A Rediscovery: Harvey Ellis : Artist, Architect. Rochester, New York: Memorial Art Gallery of the University of Rochester, 1972. Michels, Eileen Manning: Reconfiguring Harvey Ellis. Edina, Minnesota: Beaver Pond Press, Inc., 2004. I wonder if perhaps the porch was a very early addition by a lesser talent. Besides the over scaled proportions it’s very odd the way it interrupts the verticality of the turret on the left. Ellis was a major talent, and it seems hard to believe that he would do something that akward on what is otherwise a nice composition. If the addition were so early the same workmen were employed, that would make it difficult to tell. Or, of course, a foolish client may have insisted on a nice, big impressive front porch, Ellis, with his drinking problem and need for money during his life, would probably have complied. Certainly his St. Joseph business partner would have understandably chosen ready cash over design purity. Of course Ellis emphasized the horizontal in his compositions, being a bridge between the Spanish mission revival and Sullivan-Wright. The fact that he chose Arizona stone indicates that this is after the Southwest infuence began in his work. Great comments! Harvey Ellis was a bit of a wanderer and arrived in St. Joseph in 1889. Between 1889 and 1892 he produced some of St. Joseph’s finest mansions in the then popular Romanesque style. But, for those who know about Ellis, he seldom got credit for his design work while those who hired him took the credit. During his St. Joseph phase, he worked for George Mann and Edmond (variously spelled Edmund) Jacques Eckel which at that time was the leading architectural firm in Northwest Missouri. In 1901 Mann produced a portfolio of “his” work and a number of the engravings still bear the signature of Harvey Ellis including an impressive cemetery monument. Because of his severe alcoholism, Ellis was paid almost nothing (beer money, literally) for his creative design talents. St. Joseph was known as a “party” town in the 1800’s with saloons more common than churches. (Tom Pendergast, of Kansas City infamy got his start in a St. Joseph saloon) Several local brewers/bottlers/distillers became millionaires off their products. I don’t recall the name of the original owner of this house but a friend of mine rented it for over a year. As I recall, the engraving in the 1901 book showed the house essentially as it stands today with a massive arched porte cochere to one side. Parts of it did seem to date later. 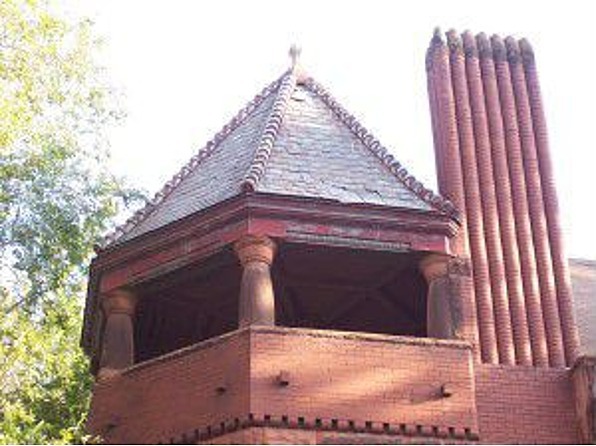 The most impressive feature in the house is the Romeo and Juliet open pavilion at the top of the tower. I’ve sat many times out on the pavilion porch admiring the expansive views and the intricate carpentry employed to create the six-sided ceiling. 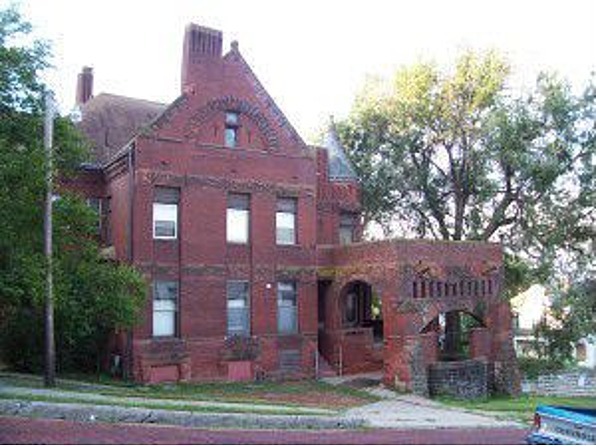 As for the Arizona Red Sandstone, as I understand it, there’s still a quarry for it today in AZ as a few years ago over $300,000 was spent replacing deteriorated sandstone blocks on the 1899 Ball-Eddleman-McFarland mansion in Fort Worth. I believe today a special sealant is used to make the stone less porous and thus last longer. There are also special masonry materials which can be used to repair this stone, but some of the blocks will have to be replaced in kind. I have a copy of the 1972-1973 book A REDISCOVERY-HARVEY ELLIS, ARTIST, ARCHITECT so it was helpful in learning about Ellis. He finally kicked the alcohol habit in the 1890’s and hired on with Gustav Stickley’s firm as illustrator for The Craftsman magazine in 1902. His career there lasted less than two years until Ellis died in Jan. 1904. 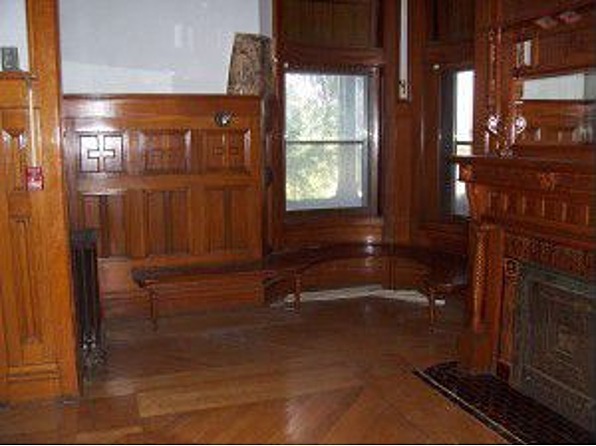 The early Stickley designs attributed to Ellis bring the highest prices at auction and his design influence was present in Stickley designs years after he died. His architectural legacy in St. Joseph is less studied but during the short period he was there he left an impressive number of mansions all bearing his signature style and details. No doubt, the “Romanesque” flavored cemetery monument he designed is still there as well. I knew the original long-time owner when I lived in St. Joe from 2004-2006 but I believe someone else may have bought the mansion and maybe now is trying to flip for a profit. Regardless, because of condition and location (it is surrounded by minor cottages and workers dwellings not in perfect condition themselves) it will be a tough sell. Great house, though. 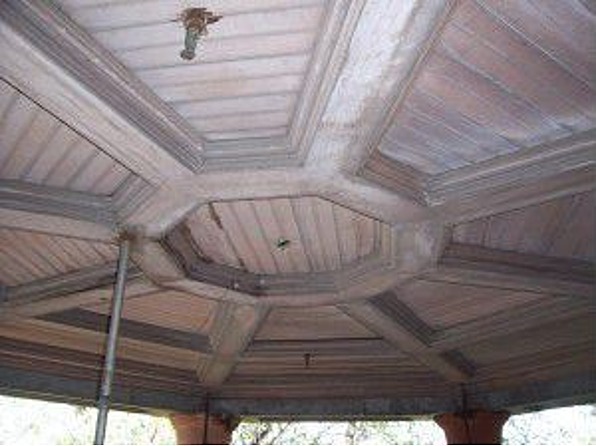 Correction: the open air pavilion ceiling is actually Octagonal not Hexagonal. John and others, I found it interesting that one commenter above mentioned that it looked beer baron like. Reason is, the original owner was J.D. McNeely who was a Saint Joseph Wine and Cigar merchant. As John mentioned, I am his friend who spent the better part of six months living in this house. Even though the area is rougher in appearance, I never had a single problem. I did hear voices and other sounds but the only incident I had which scared me was the fire alarm system which had been used for the care home before being closed malfunctioned one night lifting me out of a deep sleep. Though I had a coronary! I have many fond memories of these times and loved the tower where I would smoke my cigars while watching the sunset over downtown, the river and Kansas beyond. The only comment I would add, John, to all that information is one important only as a reminder of the perils of life: Although Ellis kicked the habit for approximately 10 years, he relapsed as his health declined in the year before his death. No doubt that accelerated his decline. For me, if I were interested in living there, the house would have to be sold near the Zillow bottom range, I oowuld have to be sure about the sealant as a retro-additive, and I would have to begin a course in weight lifting to move, carve and restore stone blocks. I know I am late to the party but thought if readers seeing these comments now may benefit from my experience with sealants. After throwing a couple of thousand at a roof area and chimney and countless professionals to try and stop a leak along a large stone wall and chimney, that I believe has been on going since my 1960 MCM was built….we threw a last ditch effort at it with a $500 stone sealant treatment. LEAK WAS GONE INSTANTLY. It took me seven years to come to that solution.and it is supposed to last for 7-10 years and then you just spray it on again. I would have to look up what sealant it was but sealants DO WORK. So there is hope for this homes stonework. The setting puts it in the category of the even more unfortunately located Dr. Generous Henderson House in Kansas City, MO (http://oldhousedreams.com/2011/12/15/1899-second-renaissance-revival-kansas-city-mo-425000/). The scruffiness of the location is such that the price, whether $245,000 or $2450 or $2.45M makes no real difference; even if the city were flooded with decades of unheralded prosperity, the immediate setting is never going to be a prize. Oh my that house is heart breakingly beautiful. I wonder if it sold? According to Trulia, the Dr. Henderson house is in foreclosure and owned by a bank which still has it on the market. Just wanted to clarify, comment is about the home Robt. W. linked to NOT the posted home. I would buy it if we weren’t in our sixties, and having restored two other 19th century homes, we are not anxious to do so again at our ages. However, I have always been fascinated by this house, but have not been fortunate enough to see the inside. If we were in our 30’s, we would buy it! It does not have other fancy mansions around it, but I wouldn’t really consider it THAT bad of a neighborhood, although not the prettiest. St. Joseph has a relatively low crime rate, and although it is not the most up-and-coming place in the world, it is not a bad place to live. The schools are not bad, the cost of living is low, there is not a lot of traffic, and you are only 50 minutes from Kansas City, where there is lots of culture and good restaurants. Sue, I essentially agree with your views. And, in defense of this location, I’ve walked the streets around it and met some of the neighbors. They would be insulted if you called this a “ghetto” and rightly so. It is located about mid-way between the Pony Express Musuem (a national historic landmark) and “Museum Hill” where the former Tootle Mansion, a rare castellated Italianate stone mansion, was later used as a community museum. When I lived there, the north side (far away from this location) was considered far much more marginal in terms of safety. I myself rented and lived in a c. 1899 house on Olive Street not very far away and I never felt in danger there. But I stand by my weak local economy claims and depressed wages (in 2004-2006) for old house tradespeople. This neighborhood aspect is, to me, more curious than anything. As I stated before, a house like this presumably would have been built on a site of several acres of ground — at least a mini-estate. Yet here it is seemingly surrounded by much smaller houses and duplexes of about the same age. If someone was going to build a house like this but on a smaller lot next to other houses, surely the choice would have been the beautiful area of about the same vintage which is now St. Joseph’s historic area? And while sometimes a would-be captain of commerce liked to build on a prominent niche or raise of ground overlooking all his employees’ hovels, much as a baron might build a castle knowing that the peasants’ hovels would soon crowd round, that actually was occuring less by 1890 than one might imagine. There had been too much labor unrest already for any businessman to be that comfortable. Could I suggest something that someone there in St. Joseph might investigate? The build date on this is 1890. That date in a building of this size is surely inaccurate in at least the aspect of duration of construction, even if it is a start date. The construction might have begun in 1890 but been finished by 1892; if begun in late 1890, this might have neared completion in 1893. That brings up the possibility that the house-plan may have been altered to suit the economic decline occuring as a run-up to the coming Panic of ’93. 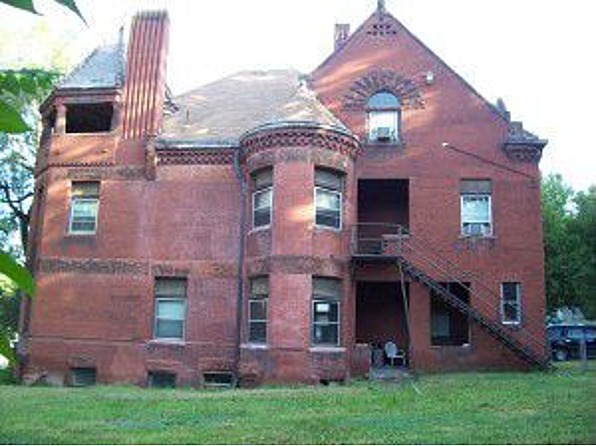 If that occurred, then that is consistent with the lots being created out of the intended “estate-yard” in those years when the Panic continued — through 1897. We tend to forget that the Panic was the worst contraction this country had ever seen until the Great Depression. If that local foundation there I mentioned before has client-architect documents and if the local Recorder’s office can show when the various smaller houses and buildings’ lots were sold, a great deal of the mystery about this building might be resolved. Finally, I wonder whether Sanborn maps or the like might reveal whether originally there were ancillary structures such as a home coal-gas plant, a fruit-cellar, etc, etc, as well as a different approach that explains the porch. Sue. since you have done this sort of thing before and know the area, two questions: Iif you were in your 30s, what price would you think fair to buy this place, as you understand it to be today? And how, in your 30s, would you propose to make a living there in St. Joseph? I think those younger than you and myself might well be pretty interested in your answers, given your experience and obvious intelligence. Interesting points, John. The decidedly working class but more or less contemporary duplexes in proximity are a puzzle. I differ a bit on your point on the house lot having been intended as “a site of several acres of ground — at least a mini-estate.” The design is decidedly urban, as it its placement on the lot, quite close to the sidewalk on both 11th Street (facade) and Locust Street (side elevation.) Whatever the lot once was, unless the whole street grid was superimposed after the fact of its construction, a generous double-lot seems more likely to me. The area behind the house shown as Lewis Park may hint at something important, and that’s a good point about the Panic of 1893. Perhaps the owner thought himself ahead of the curve in building in an area whose architectural fortunes he anticipated would follow his lead and soon rise to meet his own example…and then circumstances took a turn. I had never thought of the 1893 panic as having much architectural consequence, being better acquainted with the earlier panics of 1837, 1857, and 1873 and how they interrupted building plans. As you say, the house is quite close — but I took from that fact that 11th street was later. Locust, cutting as close as it does and leaving no clear explanation or reason for the porte-cochere (sorry, spell check doesn’t work here and I am in haste to leave), is really, I thought, an argument in favor of the place having been intended to be bigger. Of course, adding tothe confusion, the area may have been platted — but then someone bought up the lots intending to close the streets but soon found he could not afford to do so. We tend to forget the Panic, because the same year saw the Chicago Worlds’ Fair, which so influenced architecture. Yet the Fair itself tettered on the brink of financial collapse given the gathering economic storm. We tend to forget that once the Fair closed, not much was built for some years — which accounts for why when the economy began to move again the neo-classic style of most of the Fair burst upon us full force — the journals and critical thinking for large and public buildings had been all neo-classic for five years or so before the construction boom began again. Intresting speculation. However, I’m fairly confident this house was completed as designed. (as seen in the 1901 Geo. Mann portfolio) As for the much more modest dwellings surrounding the mansion, that pattern is repeated time after time in St. Joseph. Mansions were built right next to very small existing worker’s cottages. The mansion does have a brick carriage house and behind it ruins of a brick vaulted ceiling root cellar. The only solid area of mansions in St. Joe is in the Hall Steet Historic District; otherwise, mansions are spread out sporadically throughout town. Zoning laws were non-existent in St. Joe back in those days. John C., in answer to your question, I should have said I would buy it if we could afford it–not sure if we could, as it would be a very expensive restoration project. What I was really saying is that I would not let the neighborhood stop me from buying it. I live in the Museum Hill neighborhood nearby, and although most people would not think it is a “good” neighborhood, we have lived here for 20+ years and have not had problems. I’m not a real estate expert, and I know this house has been for sale forever, but I would pay a lot for that kind of beauty in a house. Owning an old house like that, to me, is something that you would not think of in terms of money, although realistically I know you have to. We know we will never get out of our house what we have put in it, but it has given us 20 years of living in the kind of house we have always dreamed of, and that’s worth a great deal. We are not rich, but have been able to make a comfortable living here. We both have degrees, although the fields that we have worked in have not been the most lucrative (social work, education, mental health). My husband is retired, but I am still working (by choice). We are frugal, and are able to delay gratification, but do allow ourselves to do some travel and to partake of the arts. It has taken us more than 20 years to restore our house, and truthfully, we are not quite finished. For many years, we took no vacations, because much of our money went to the house. We only did things as we had the money to do them, but we did not mind living in a house that needed work. We did not borrow money to work on the house. Our other house is across the street from us, and we bought it to so that a slumlord wouldn’t. We are renting it out, so we did have to borrow some money to get it in shape in a short time period. Although we don’t make much profit from renting it out, it does pay the mortgage. By the way, both houses will be for sale at bargain prices in a couple of years when I retire for the second time, because we are moving to KC. That’s nothing against St. Joseph, it’s just at our ages we don’t like having to drive an hour down the highway every weekend for entertainment. Plus, we will be closer to the grandkids. There is a major medical center here that I think is our largest employer. The school district is the second highest, I believe. That is my current employer (in adult education). There is also a growing animal health field here and a state university. I’m not denying that St. Joseph has MORE than its share of poverty, and in my many years of social work, I saw a great deal of generational poverty. There is also generational wealth here, but unfortunately, the powers that be are not that interested in preservation, and would not live in a neighborhood like mine. However, there is a couple (a doctor and a former airline pilot) who built in my neighborhood a million-dollar home that was supposed to resemble an old mansion. My neighborhood is a mixture of nicely restored homes, boarded up ones, and rentals. It is very diverse racially, socially, and economically, and I enjoy that, although I am not happy with the slumlords. Sometimes, we drive around in the new subdivisions after subdivisions of very large and expensive (for St. Joseph) houses and I wonder, “Who lives in all these houses?” Obviously, there are people with money or people who are in a lot of debt. Either way, I know very few of these people, but the housing is there and it is occupied. I am sorry to go on so long, but in rethinking your question, the answer is yes, if I were in my 30’s and my husband and I had the same employment circumstances we did then, we, being young and idealistic, with lots of years in front of us, would seriously consider buying the house for as cheaply as we could, and then we would live in it while restoring it for the next 20 years or so. We might bite off more than we could chew, but what a wonderful house! Now if we wanted to be realistic and eventually make a profit, well, that’s another story. But to me, an old house is a thing of love. P.S. John Shiflet is right. It is not unusual here to see large mansions built next to small cottages. That is one of the things I found so fascinating about St. Joseph when I came here, along with the buildings that used to be corner stores on about every block or every other block. This is a remarkable letter. You, Sue, no doubt think it is remarkable because you live in a remarkable town, but it remarkable mainly because of the wonderful grit and spirit and intelligence you and your husband display throughout what you write and recount. This is really inspirational. There is preservation at the planning stage for a town, preservation for the person with lots of money who hires work done, and then there is preservation for and by the person who simply won’t let good achievements in architecture and all that makes up a home crumble away, but instead will improve and preserve it. I am at your age, and I had asked my question really with a certain nephew in mind. I will shoot this on over to him via e-mail, and if this won’t get him rolling, well, I’ll talk to his mother. (The ultimate threat to an early middle aged gentleman.) This place, another place, some place, but now is the time to get that baronial house you want! Thanks so much, Sue, for this. Now, if you later read about some uncle being served sparkling cyanide at a family gathering while propounding preservation to a relative, don’t feel guilty! Thank YOU, John C, and I hope together we can be an inspiration for your nephew! Speaking of Sanborn, it’s the big pink house at the corner of Locust and 11th Streets. MIGHTY INTERESTING! Wow! You don’t have the other side of 11th Street for the 1897 map as you do for the 1911 map, by any chance? It’s probably in another section of the map searches but that was the edge of that particular map. Well, you have done yoeman’s work in aiding my speculative daydreaming. Thanks, thanks, thanks. John, your solid local knowledge is amazing. Probably I am too much influenced by the fact that here in Chicago and Illinois generally, after the Haymarket Riot plutocrats were leery of the undercrats too much to wish to live next to them. Seems like we all love this one, maybe a time share would be a win,win situation if we weren’t all busy on our own old homes. I am also on my 3rd old house, at 55, the energy is running out. Thank you so much Kelly for all the dreams. I lived across and down the street in a house that was built in…1890! While some of the neighboring houses to the north (to the right when looking at the street view) may well have been built much later it’s also possible that they’re simply in-fill for house of the same period now gone. We have several (not really sure of the number – but I’m told more than anywhere else! 😉 ) of these mansions and none of them are on even a “mini estate”, they’re in neighborhoods. This one, however, IS off the beaten path. We have just moved into central Hyde Park in Kansas City and have been told that our house is the only Harvey Ellis design in Kansas City. I’m anxious to confirm this and to put together a full history of the house. 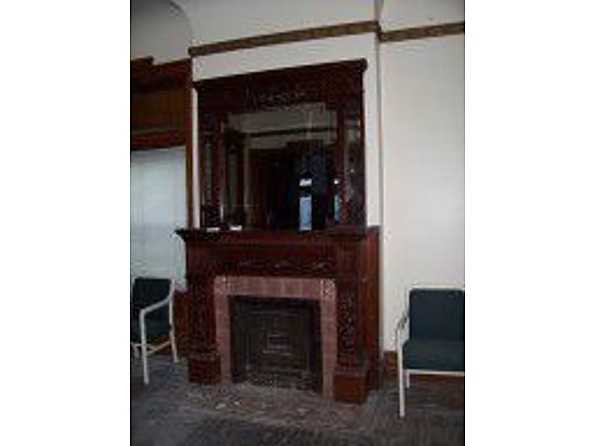 It was built for the Mosher family in 1887 or 1892 and is sandstone and brick. The problem with Harvey Ellis designs is they were often done with other architects getting the credit. George Mann, an architect partner with Edmond J. Eckel in St. Joseph, had a larger regional influence. Both used Ellis’s talents and in a 1901 portfolio by Mann there are designs with Ellis’s signature on them. If you can post a photo, a design by Ellis stands out and would make attribution easier. John, thank you for your assessment of St. Joseph. Every time we visit, we are dazzled by its jumble of fabulous Victorians, abandoned, monstrous brick piles of civic pride, and vacant lots. It’s a glorious, sad place that always prompts the question: “What’s the matter with St. Joseph?” Thanks for helping answer the question. Back on the market. Here’s hoping for new, quality images..
Let me make a few corrections on some of the information posted. I am a direct descendant of J D McNeely or Jame Dowd McNeely, he is my great grandfather on my father’s side and I have the same surname. J D McNeely was the founder and owner of his own wholesale liquor business. He had three son’s that I can remember, but I think there were other children. I believe the oldest was Uncle John, the next son was William (Bill) and the youngest was Uncle Arthur. Bill was my grandfather. Both Uncle John and Grandpa McNeely passed before I was born, twenty years and further back. I met Uncle Arthur a few times when I was in grade school before he passed. That is some background but back to the purpose of this site. Uncle John built the house in 1900, according to my father. I haven’t validated that, nor tried. 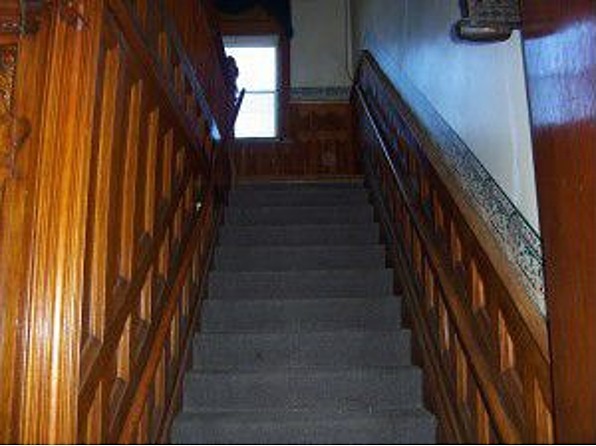 But based on the earlier information provided on this site, you can safely say it was built after 1890 and before 1900. Also, my father told me the house was built with a cost of $50,000. Uncle John was a lawyer and practiced law in St. Joe and in KC. He was a distinguished Colonel in the army, as well, before his law career. My grandfather inherited and ran the wholesale liquor business. Uncle Arthur was an accountant. I am sorry to say I don’t know a lot more about this house that was not already stated. However, I did see the house in my early 20’s, about 35 years ago and all the photos brought back that memory.. I live in California and have many relatives living in MO, including two of my cousins who undoubtably will have more information on this house. If I get any additional informtion on this house or information about my Uncle that relates to this house, I will post again. 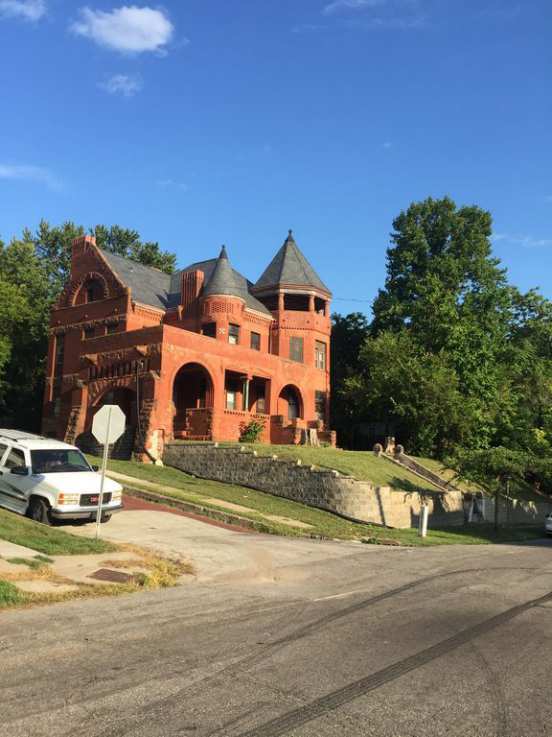 Still on the market at a lower price: https://www.zillow.com/homedetails/701-S-11th-St-Saint-Joseph-MO-64501/110497627_zpid/ The property will need a substantial amount of work but remains one of St. Joseph’s gems. I’ll update today and move it to the front page. Thanks. Updated, move to front page. Kept the 2012 listing photos, as captioned, along with the new ones. Comments above may be older. Oh how tragic. It’s nice you kept his replies in. His passion for old homes lives here. I wonder what it looks like now and why cash only? In one way I admire the sellers for insisting on keeping it a 1 family and not stripping the interior, but on the other hand if all the factors in the comments are conspiring against that maybe the best thing to do would be to salvage the woodwork before it goes the way of the missing stained glass windows and crumbling stone. it is a sad situation no matter how you look at it. Sue, I think the owner (who I knew when I lived and worked in St. Joe between 2004-2005) doesn’t want to finance the sale with a private mortgage. 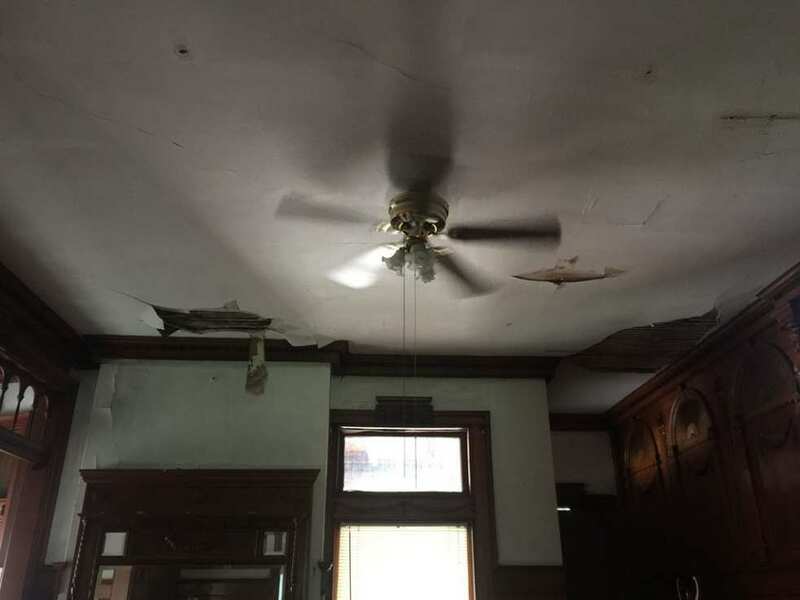 Lenders generally will avoid financing a large fixer-upper house like the McNeely mansion because they are difficult to re-sell if they foreclose on a property. It it were mine, I’d also try to sell for cash only and “as is”. I have been in this house many times as a friend of mine was the caretaker for a while. 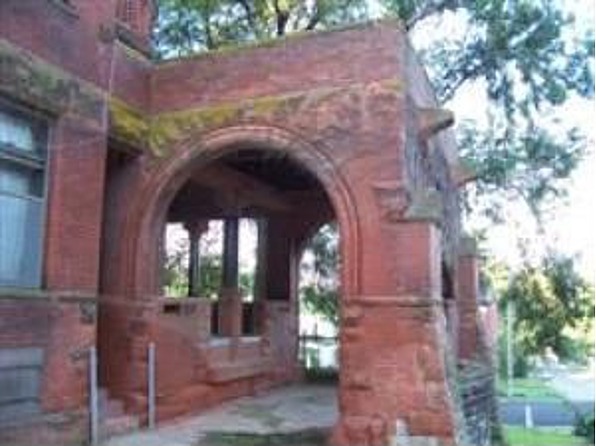 He and I would sit up in the tower pavilion porch with its panoramic views and discuss historic preservation in St. Joe. This house deserves much better as it is one of the more successful designs by Harvey Ellis who is best known today as Gustav Stickley’s chief designer until Ellis passed away in 1903. 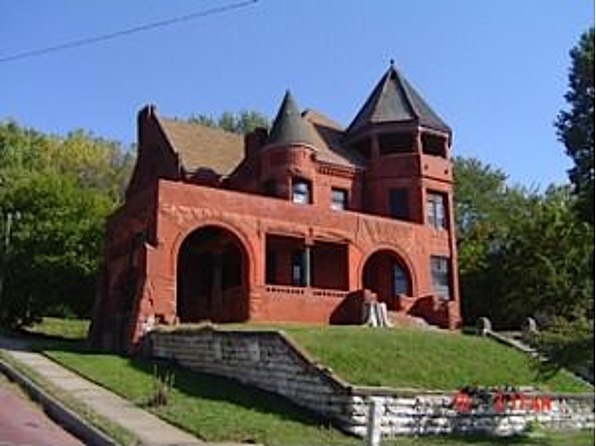 Ellis designed about a half dozen mainly Romanesque style mansions in St. Joseph between about 1888 and 1892. He was originally from Syracuse, NY. All I can advise to any potential buyer(s) is to plan a restoration methodically. Fairly deep pockets will be needed for a full restoration as many of the Arizona red sandstone blocks (including some with carvings) will need to be repaired or replaced. I’m fairly certain the original quarries are still in operation because I recall another house with these fragile soft stone blocks replaced a fair number of them about a decade ago. (as part of a $300K restoration) The neighborhood is a bit transitional but safe. This mansion was built before zoning laws were enacted so you have small modest workers cottages next to mansions. That would never happen these days. The agent, Lisa Rock, was my landlady when I lived in St. Joe and has been actively involved in historic preservation for decades. 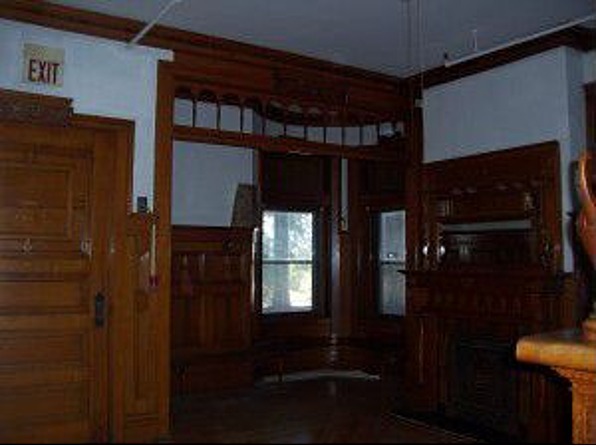 (she even restored her own turn of the last century home) Therefore, she is very knowledgeable about St. Joe’s wealth of period homes and can fluently discuss styles and period details. I’m keeping my fingers crossed for this one because it has been looking for a caring owner for some time. Fully restored, you could not replicate this house for a million dollars or more. As for the late John C., I was privileged to know him briefly and even paid him a visit at his last home in Mississippi. He was truly a larger than life figure and I feel fortunate to have befriended him. I must agree with Alice. 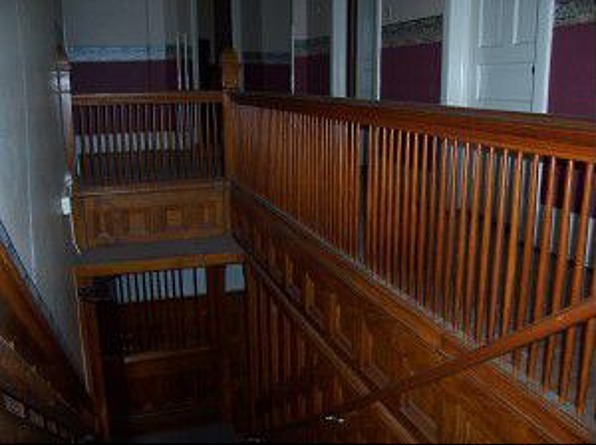 Although I generally would want to save any old home, especially one with as many wonderful features as this one, I’m afraid it might not be feasible. 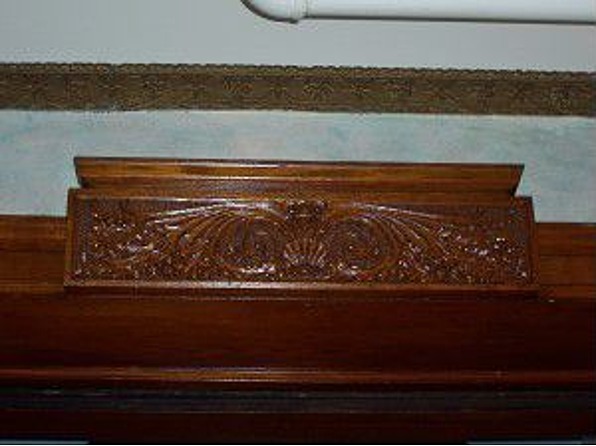 I as well, hope that the beautiful interior trim can be salvaged and used elsewhere to restore another beauty. This is truly sad……….. I AM FREAKING OUT! FREAKING OUT! This is an incredible house. I love love love Harvey Ellis. I could care less about the less-than-incredible neighborhood. For, what a treasure this house is! I would devote the rest of my life to its resurrection. But…but…I am currently 100% engaged with a similar big-wreak-of-a-house in Kansas. Sigh. I really need to win the lottery. YES! Isnt she just magnificent!!? We shall continue playing the lottery until one of us wins then will call the other to come join them lol! Any ideas as to what the original layout for the drive would have been? The porte cochere appears to have access from only one side. Though this house is just full of goodies, I am particularly taken with the design of the chimneys! It feels like a beautiful old tree slowly losing its limbs, awaiting the inevitable, though it doesn’t have to go like that. A full restoration here would be a huge project, but I wonder what would be required just to make the house somewhat livable and safe, and keeping the elements out. Long-term life support is preferable to the alternative, and it only makes sense if the house is serving a purpose. For about the same price, I see another house a few blocks away, older and almost as grand, and perfectly livable. yes i saw that listing a few weeks ago and I thought what a beautiful home for the money. To get someone to invest the money into this romanesque house is going to be tough. It is a beautiful home and I love that style, but it has been allowed to go so far down that it is going to take someone with deep pockets looking for a labor of love. I do hope that person comes along, it obviously is potentially a very grand home. I have tried to read all of the comments (good gravy Marie!) but did not. Did anyone mention looking at a Sanborn Map to see what was there, as it seems to be a running concern about the other surrounding buildings? If this was brought up and I missed it, my apologies. I used to love stone buildings until I realized the horrendous expense of picking one up when the foundation was shot. This one looks like it has issues. The new roof is a plus, but if the foundation is toast, what is the point? It-sort of-looks like it’s sinking in the middle. I don’t understand your comment about the foundation, which looks fine to me. The retaining wall in the front must be a later addition because it kind of cancels out the uility of the port cochere. 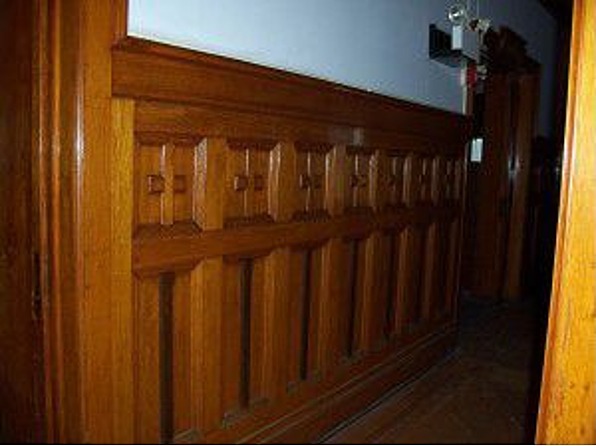 Yes, Harvey Ellis/ Gustav Stickley furniture is rare and very valuable. A great designer. I don’t find the neighborhood so grim. I wonder why there’s an exit sign on the door. Maybe tours went through it. Drat! I missed the “Captcha” entry so lost the text. 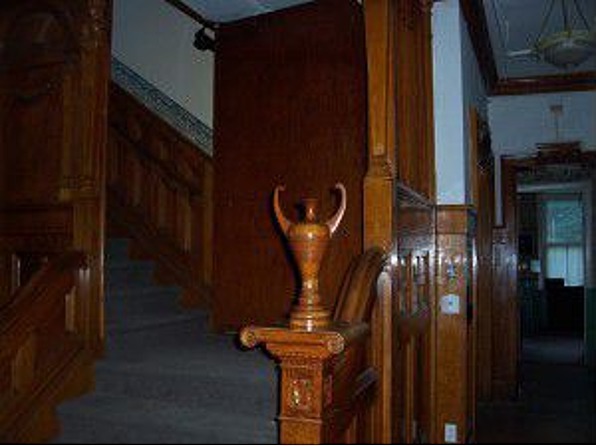 Anyways…Elliot, the exit signs are from the time when this house was a mental health facility and in case the power went out or a fire broke out the exit signs showed the way out. Since I lived only a few blocks away on Olive St. when I worked in St. Joe I can verify that this area is relatively safe albeit faded. Some individuals are trying hard to improve the area and it will take more caring individuals to make it better. When I read all the history and comments about this beautiful house, I remember why I like to visit this site so much.